Different types of boat propulsion systems exist, and to help better understand these systems we have produced a glossary of common terms. Outboard Motors, Stern drives (also known as Z Drives), Surface drives and Jet drives are not catered for by our Strippers and therefore not discussed any further. Strippers are available for both conventional (shaft drive) layouts and Saildrive systems. 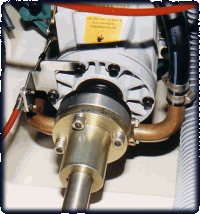 Conventional drives have an engine and gearbox mounted inside the boat. The propeller shaft is connected to the gearbox output flange by a half coupling which in turn is mounted on the propeller shaft, there may or may not be a flexible coupling in between. The image on the right shows a typical installation without a flexible coupling. One of our Spacemaker shaft extension kits has been added to enable extra space for the Stripper. The shaft will leave the machinery space and enter the hull via a stern gland, the stern gland is there to seal the hull against ingress of seawater.